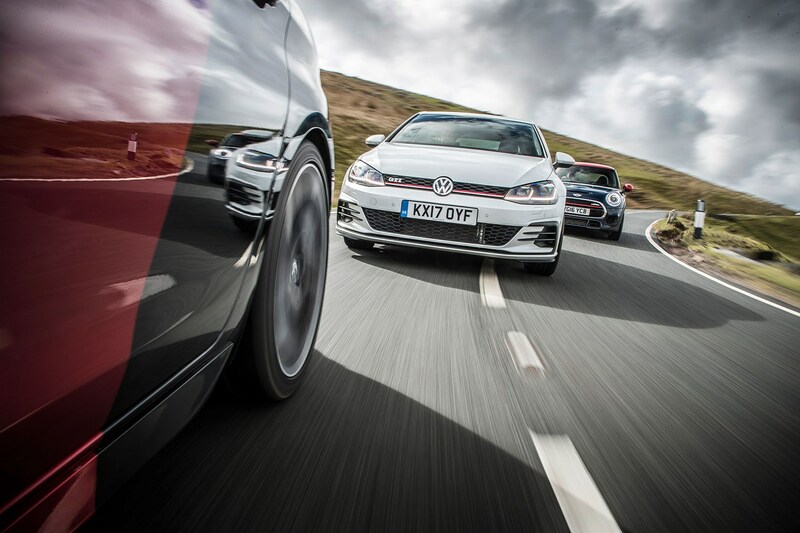 New VW Golf GTI leads the pack: but does it end up winner of this hot hatch shoot-out? Coupe Franche paintwork may divide opinion on Peugeot 308 GTI. Non, merci! The middle-aged Welshman stops, jumps out of his car and walks over to the Volkswagen. ‘What’s this then, boys?’ he asks, eyes scanning quickly for clues. We tell him it’s the new Golf GTI, that we’re group testing it against the Peugeot 308 GTi 270 and Mini John Cooper Works. He casts a dismissive glance at the strangely painted Pug and gawky Mini, then looks back at the Golf. ‘Got to be the Golf, hasn’t it?’ he declares definitively. ‘Go on, drive it like you stole it.’ Then he gets back in his police car and disappears. Based on showroom appeal alone, our Welsh copper just called a verdict in a few seconds that’ll take the CAR team two days of deliberation; and I suspect the majority of you agree. Four decades after it launched, the GTI’s look, its badge, and the promise that it’ll do the day-to-day stuff metronomically with flashes of hot-hatch flair continue to make it the default choice. Now the seventh generation has been facelifted for 2017, a gentle evolution that promises to make Wolfsburg’s all-rounder even more circular. In five-door trim, our standard GTI weighs in at £28,520. You might notice the Golf’s revised front and rear bumpers, new LED head- and tail lights, perhaps the slightly different way in which the trademark lipstick extends through the grille and into the lights like a Glasgow smile. The 2.0-litre engine gets a similarly gentle massage, power increasing by 10bhp to 228bhp, equivalent to the old model boosted by the Performance package. Inside, there’s a slick new infotainment system and driver display, and a host of driver assistance systems all called Something Assist. The rivals we’ve selected both take different twists on the hot-hatch formula. The Peugeot 308 GTi 270 (below) costs £815 more than the VW at £29,335, can’t hold an iPhone torch to its state-of-the-art tech, but adds mechanical content with a gritty integrity. Much of this will whizz over the heads of casual hot-hatch fanciers but straight into the ears of those with a 98+ blood type: a proper limited-slip diff, four-piston Alcon brakes, and 19-inch alloys wrapped in sticky Michelin Pilot Super Sports. 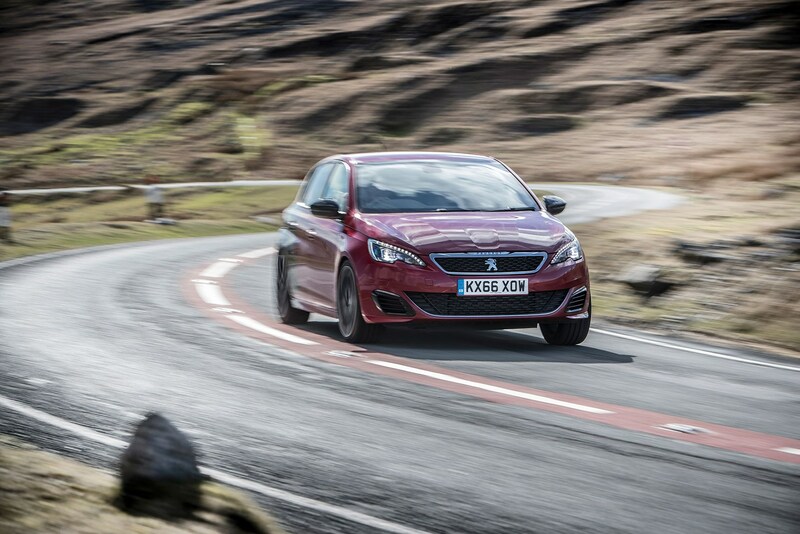 At 266bhp, the Peugeot also hits 38bhp harder than the Golf, and scoots from 0-62mph 0.4sec faster at 6.4 seconds. All with just 1.6 turbocharged litres. Even the Mini John Cooper Works needs 400cc more. Its 228bhp can only level-peg with the Golf GTI’s output, but it undercuts it on price by over £4k, and because it’s lighter, it bests the GTI’s 0-62mph time by 0.3sec at 6.1 seconds. 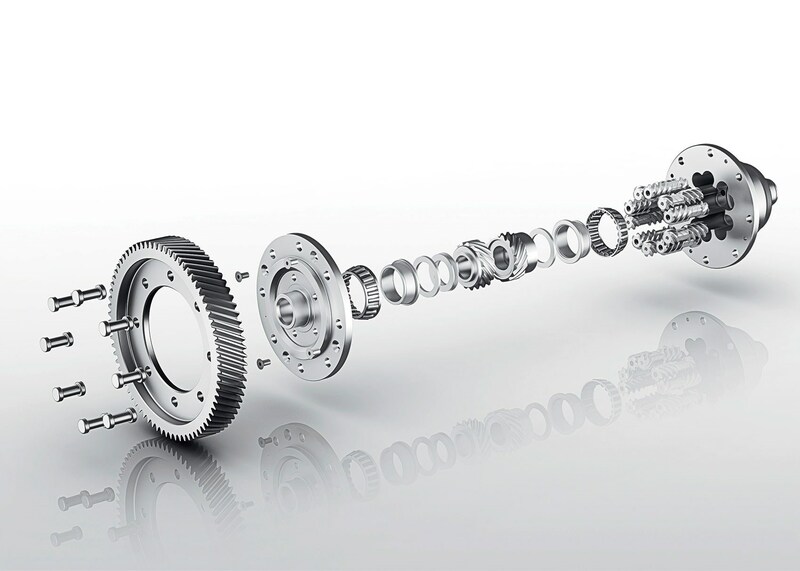 There’s no limited-slip differential (as on the Golf, electronics mimic the effect) but you might notice the spokes of the optional 18-inch alloys fanning out like petals, clearing the four-piston Brembo brake calipers by millimetres. Our car also gets the optional six-speed Steptronic automatic transmission. Don’t groan – it’s much better than expected. That it boosts mpg from 42.2 to 49.6mpg doesn’t hurt. I drive the Golf over to our test location the night before. It’s a no-nonsense spec, with a slick manual gearbox, standard fixed dampers and 18-inch alloys. It rides nicely, if less compliantly than my old Golf R long-term test car on 19s with adaptive dampers; there’s just a slightly harder edge. But it still does long-distance schleps effortlessly: the heated seats with their generous padding and snug bolsters (and £1750 optional Vienna leather) are fantastic, the driving position faultless, comfort and refinement impressive. I struggle with the new infotainment system. Discover Navigation looks slick and impressive with its 8-inch touchscreen, and is easy to fathom at a standstill. But I often accidentally select the wrong function while driving because there are no physical buttons: the sat-nav disappears with one unintentional prod like Crimea from a map of Ukraine, and I accidentally switch off Radio 6 Music. Very distracting. Active Info Display is also new, and more convincing. It’s Audi’s Virtual Cockpit by another name, 12.3-inch of TFT digital freshness that slots in the instrument binnacle. You can configure it in five different ways, prioritising info like sat-nav or speed or fuel efficiency figures. Mostly it works well, but the fuel gauge is a white needle on white increments, like painting the ‘x’ that marks the spot the same colour as the spot. 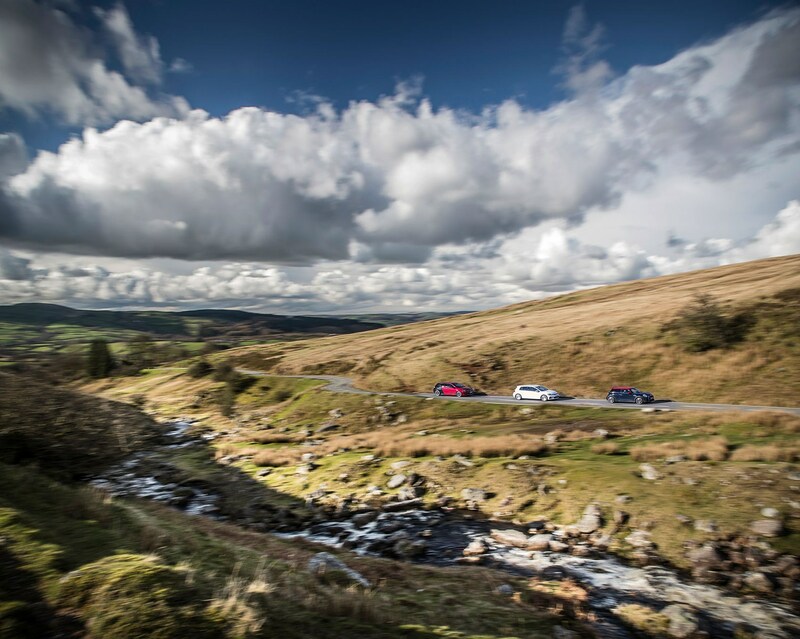 Our overnight stop is close to the Welsh border, and during the last hour or so of driving the damp roads tangle like tributaries, the Golf’s LED headlights bringing daylight to the pitch-black back lanes. The GTI is fabulous here, because everything is in such perfect balance: the easy lightness and linearity of its steering, the six-speed manual’s crisp action, the eager performance that indulges the wrong gear here or there. You can drive the GTI right to the edge of it capabilities, feeling entertained yet safe, knowing nothing will catch you out. Or you can wind back and its performance will sink into the background. Hard to call it thrilling, though: the turbo four energetically picks up speed from below 2000rpm, and hauls strongly through the mid-range so you can pick off dawdling traffic in easy chunks, but it’s not the most compelling soundtrack, and at high revs it feels like it’s out of oxygen on Everest. Similarly the chassis lacks that last degree of engagement: you can coax it into playfulness, but the stability control quickly reins in the exuberance and can never be switched off altogether, unlike the Golf R’s. The GTI needs more attitude. The GTI Performance upgrade would help. The £995 option brings not only a 15bhp power hike and larger brakes, but also a mechanical limited-slip diff for extra traction. The slight scrabble and lack of positivity from the Golf’s front end under determined acceleration from corners makes it clear our car doesn’t have one. Combined with the strong but unremarkable power delivery, I’d already be suffering buyer’s remorse if I hadn’t ordered the upgrade. Later, when I set fire to the brakes like I’ve just tossed a match on a pile of dry leaves, the feeling intensifies. That night I meet up with Ben Miller and Matt Tarrant, then head out in the Peugeot 308 GTi 270 the next morning. It’s a welcome reacquaintance a few months after handing back my brilliant CAR long-term test car. This 308 is very lightly optioned, with just the £1300 Coupe Franche two-tone paintjob. 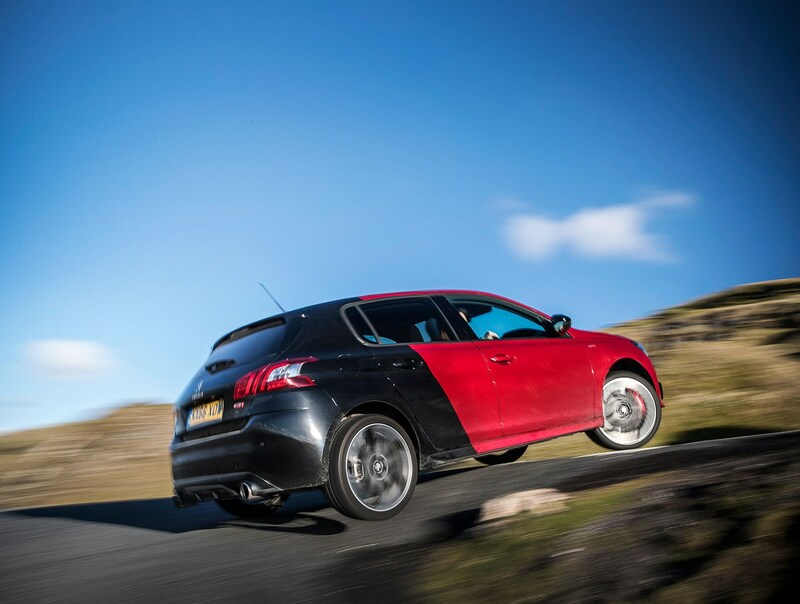 So while our ‘cheaper’ Golf is optioned to £32,940, the Peugeot turns the tables with an as-tested £30,635. You just can’t give Peugeot that much extra money. The interior can’t match the satisfying precision of the Golf, but it is neatly and stylishly laid out, if plagued by an infotainment system that’s about as clued up as the French intelligence services. Heater controls on a touchscreen are just a bad idea. 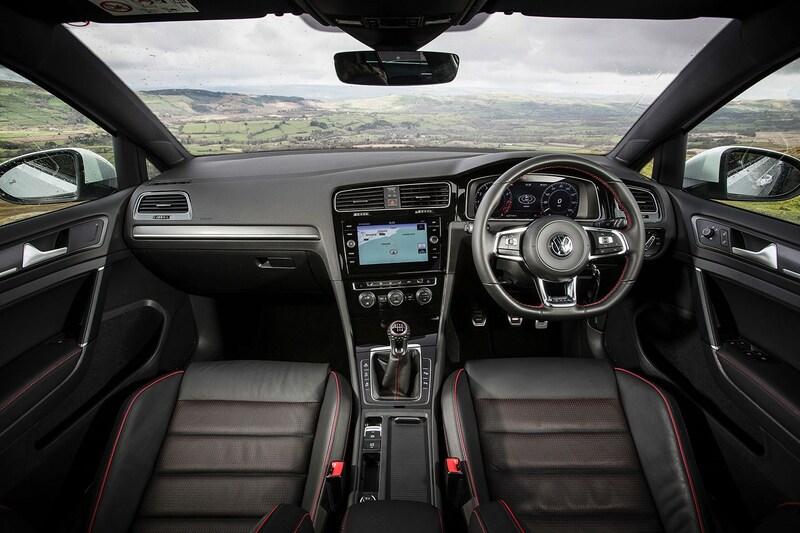 You sit high in excellent sports seats, fitted as standard. The bolsters are upholstered in convincingly faux leather with grippy alcantara centres, the bases comfortable, lateral support excellent, the standard massage function ironing out knots in your lower back while you lift-off oversteer your way cross-country. Ahead of you, there’s a leather-wrapped steering wheel the size of a bread plate. 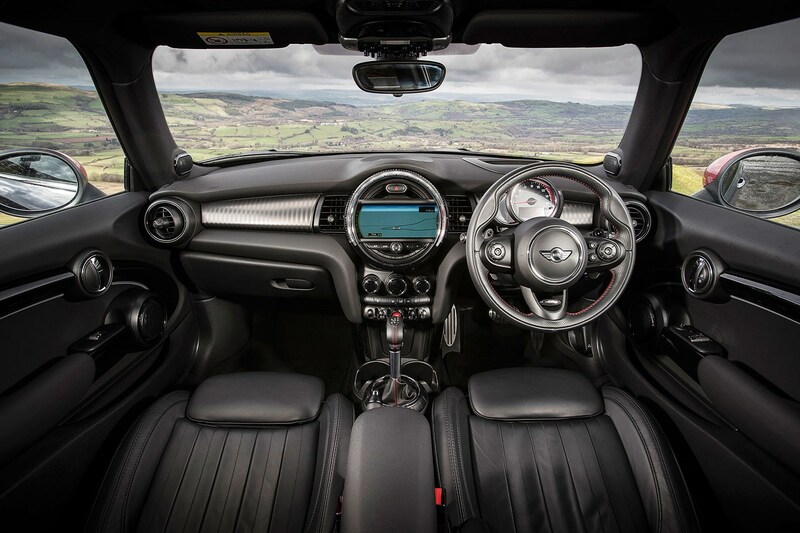 No car with a steering wheel so small could be sensible; it adds to the Pug’s feeling of playfulness. At 1205kg, the Peugeot’s claimed weight seems almost unbelievably crisp-packetish. That’s 189kg lighter than the Golf, and 15kg lighter than the Mini. 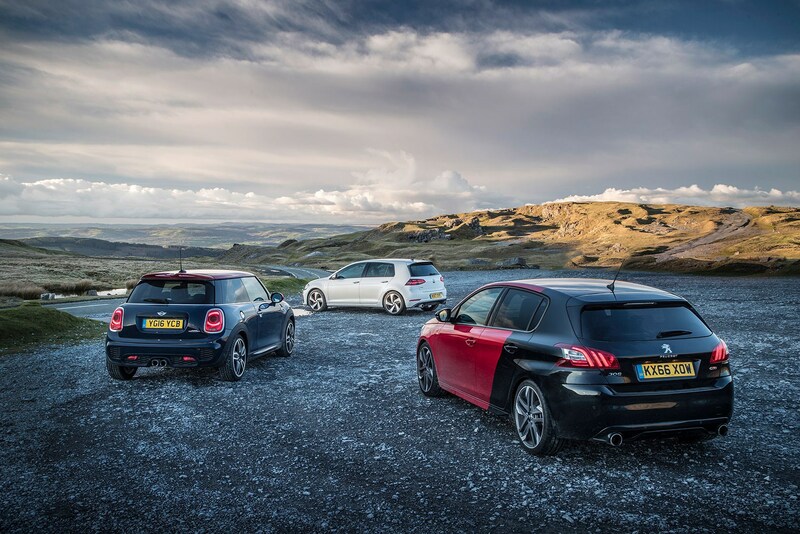 Combined with a power output around 40bhp clear of the others, the 308 romps it with a power-to-weight ratio of 222bhp per tonne, compared with 163bhp for the Golf, 187bhp in the Mini. Huge. You immediately feel that difference on the road. The 308 is firm, but rides with a light-footed keenness, pliancy and tactility that makes the Golf seem inert, more one-dimensional. It also feels incredibly alert and playful, the softer front end darting obediently and digging in with every little nudge of the steering, the torsion-beam back end pivoting about like a sidecar passenger jumping from side to side to optimise weight distribution. The small amount of body roll helps key you in to that fluidity, so too the electrically assisted steering, with its easy, progressive weighting and light fizz of feel. Stability control? All gone with one little push. Build your confidence, push on hard and the benefits of the 308’s limited-slip diff and four-piston brakes are soon apparent. The diff lets you power on through corners where the Golf would scrabble, and keeps you tight to the inside line with only a hint of steering corruption. The Alcon brakes are nicely modulated and offer huge reserves of stopping power, feeling as if they’ll stand the Peugeot on its nose like Roadrunner screeching to a stop while the Golf in pursuit sails over the cliff, billowing smoke. Trickle out of a junction in second gear and you’ll notice the dead spot in the Peugeot’s delivery until well past 2000rpm even if the stats say the peak 243lb ft kicks in at 1900rpm. But generally that’s glossed over in normal driving, when the turbo’s fuse is almost always lit. Then it pulls hard on a wave of energy and boost, and you flick between the close ratios via a wand that could be shorter and slicker in its action, but never frustrates. Perhaps it’s because this car’s tyres haven’t endured 15,000 miles and its brakes haven’t been hammered at Silverstone, maybe it’s because it doesn’t have the panoramic roof, which added weight to my old car in exactly the wrong spot, but this car feels even sharper than I remember. 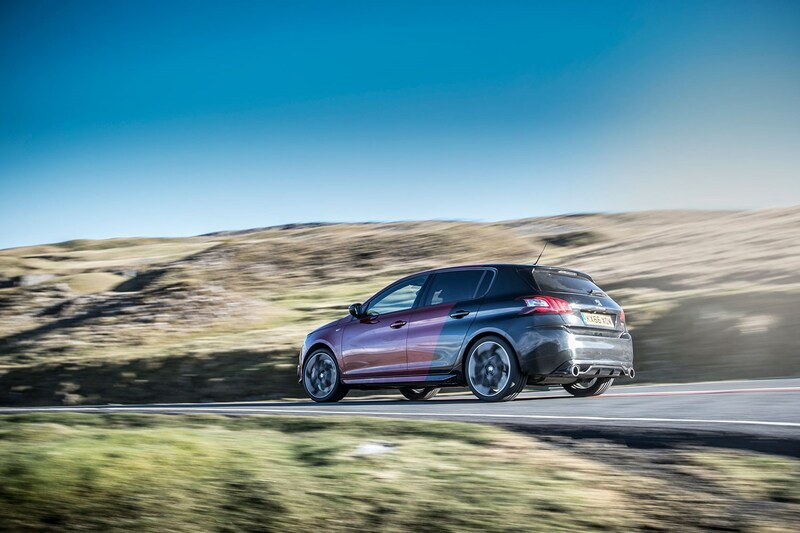 There’s no doubting it recaptures Peugeot’s hot-hatch glory days. Mini never really lost them. Climb into the John Cooper Works and it’s clearly a less practical prospect than the others: the upright screen and carbuncular door cards threaten to compress in around you like the Star Wars trash compactor. If the cramped quarters are a deal-breaker, remember you can now get the Mini John Cooper Works in chunkier Clubman or Countryman body styles. But only as an emergency. The interior is wilfully quirky. The iDrive infotainment is as excellent as on any BMW, and I love the ring of light around the huge infotainment screen, which warmly glows like an automotive heartbeat, telling you a sat-nav direction is imminent, or showing which driving mode you’ve selected via the vicar’s collar at the base of the gear gaiter. But the rotary dial is located way down between the seats, and when you reach for it, you’re forced to do an impression of Donald Trump doing an impression of a disabled reporter. The headlight control is located where normal manufacturers place a bonnet release. But if you can live with the dimensions and the idiosyncratic daftness, it’s a great drive, still feeling small, still keeping that distinctive Mini character despite it growing and leaving behind the real Mini that wasn’t owned by Germans and would rot like a proper car by three generations. The seating position is satisfyingly low down and sporty – though more lateral support wouldn’t go amiss – and even before you drive harder, it feels short, a little tall perhaps, and very keen to go waltzer the second you pile pressure on the front tyres and lift the throttle. 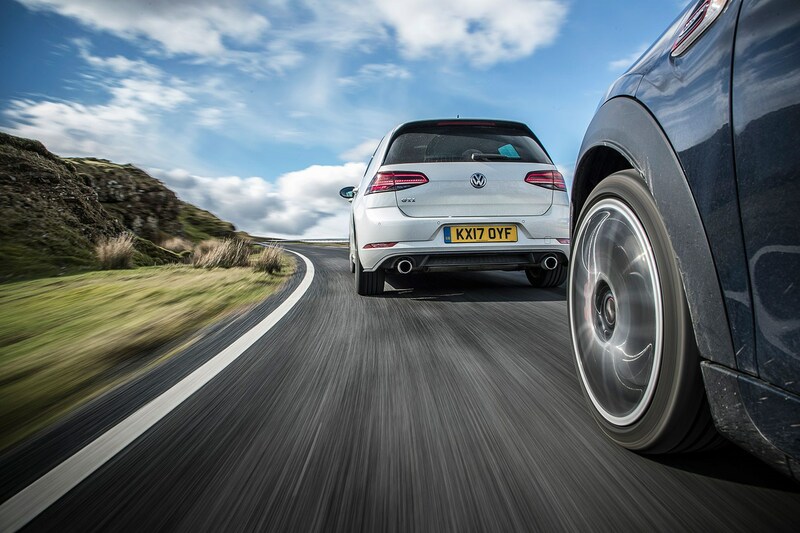 That sensation – together with the busiest, firmest suspension on test – can invite caution where the Golf in particular offers safety. But you learn to trust the Mini, picking up messages from its firm, meaty steering, building the confidence to bung it into faster corners with just an agile little shimmy from the rear, not the three-counties accident you feared. Accelerate hard in tighter corners and, like the Golf, the Mini scrabbles for traction where the 308 GTi just grips and goes, but generally it puts its power down well, and suffers little torque-steer, despite its feisty power delivery. The engine is superb, a deep and angry fruitiness zinging from the exhaust as you’re whooshed along on a surplus of eager boost, the throttle response in Sport mode making the impressive rivals seem lazy. A new turbocharger integrated into the cast-steel manifold is central to this character, the shorter pipework reducing the time it takes gasses to flow into the inlet manifold. Together with new pistons and a sports exhaust with reduced back pressure, the mods help the John Cooper Works produce 21bhp more than the same engine in the confusingly similar-sounding Cooper S Works. 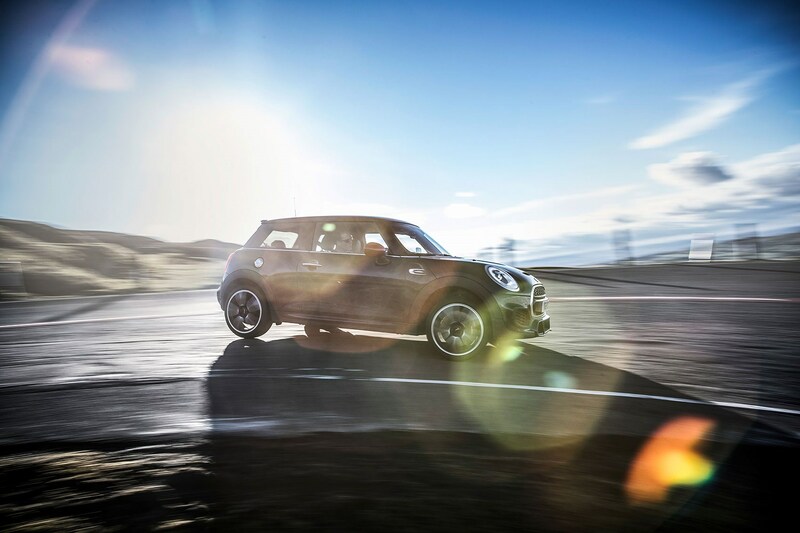 The Mini could have more straight-line kick, but it’s super-swift point-to-point because you can carry so much momentum, throwing it into corners and letting the tyres scrub the speed like you might a go-kart, or standing on the strong brakes when you’re all out of options. Even the six-speed auto works brilliantly, popping in gears instantly as you race up and down the ’box in manual, or second-guessing your intentions when you leave it in the auto Sport mode. It’s an irrepressible bundle of energy, with steering, gearchanges, throttle response and brakes that are instantly taut and responsive. As is probably obvious by now, the Golf GTI doesn’t win this test. Excellent as a day-to-day hack, comfy for the family, and fun to drive fast it may be, but a truly brilliant driver’s car? Not for me. Partly, I think a recent stint in the pre-facelift GTI Clubsport is to blame, a stiffer, faster, more focused machine that traded little of the GTI’s day-to-day usability but added significantly more driver appeal. I’d either buy one of those, or get your new Golf with the GTI Performance pack. The Mini JCW is pricey for a Mini, but significantly cheaper than the Golf. It’s also sensational to drive, feisty and instinctively responsive, like you’re strapped to the back of a yappy dog chasing a pigeon. It’s far more entertaining that the Golf. You want and expect that from the JCW badge. But with its focus comes compromised practicality, a choppier ride (although adaptive dampers are available), a car that’s likely to be more wearing as a daily driver, if far from unbearable – I drove it three hours home and enjoyed every second. The 308 GTi isn’t quite as aggressive as the Mini, but it delivers an even more exciting driving experience with a slightly lighter touch. The way it combines its benign but adjustable balance with supple suspension, sweet steering and a willingness to balletically dance through Wales is particularly satisfying. That you get such high-quality content – diff, brakes, sticky tyres – only underlines its appeal. 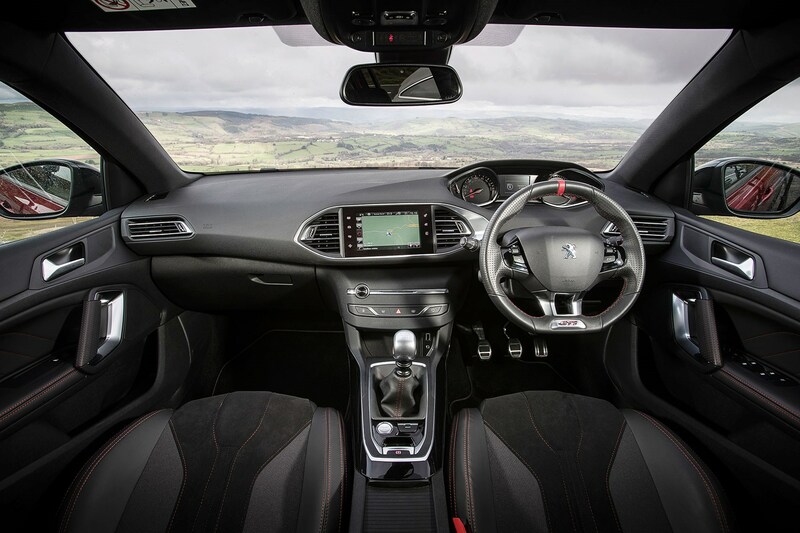 Then you fire up the Peugeot configurator and realise you don’t need to spend much more than the list price to get your dream spec, that it was easily the most economical car on test at a recorded 31.8mpg and that you’ve got a practical Golf-sized body, and the 308 GTi looks like a very solid buy. Maybe there’s a middle-aged Welshman looking at these pages and still thinking ‘Nah, has to be the Golf, doesn’t it?’ But it doesn’t. It’s the French GTi you want, copper. 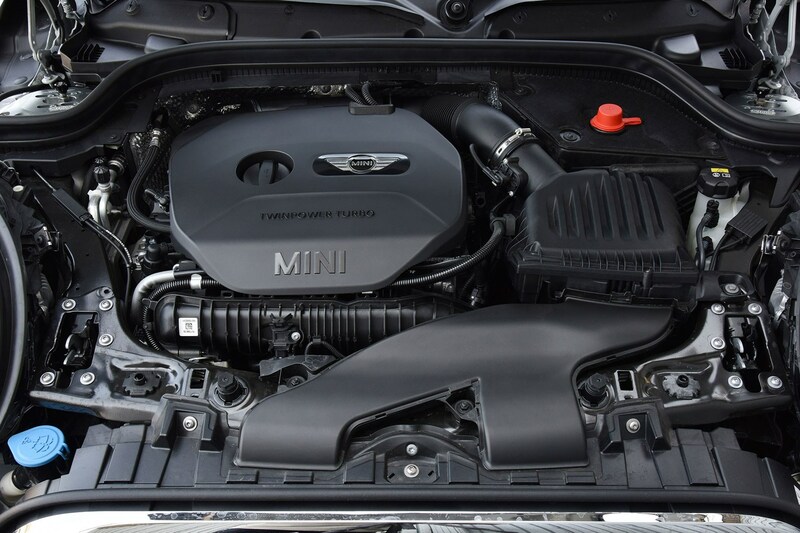 The Mini JCW’s direct-injection 2.0-litre turbo engine is shared with other Cooper S models, but there are key differences to generate 228bhp at 5200rpm and 236lb ft at 1250rpm, up from a Cooper S Works’ 207bhp at 4700rpm and 221lb ft at 1250rpm. JCW-specific content includes a new turbocharger to deliver additional boost, revised pistons and a new exhaust with reduced back pressure. That’s pretty extensive in the context of a relatively modest hike. Peugeot used to offer a cheaper GTi 250, but it’s been dropped because the 270 is better value. Key to the 270’s appeal is a Torsen limited-slip diff and Alcon brakes. The diff is incorporated into the gearbox, and stops the inside front wheel spinning away power for a much more positive turn-in under power. The Alcon brakes clamp grooved 380mm front discs with four-piston calipers and are mounted on aluminium hubs. Serious kit. All new Golfs come with a new infotainment system and 6.5-inch screen minimum. 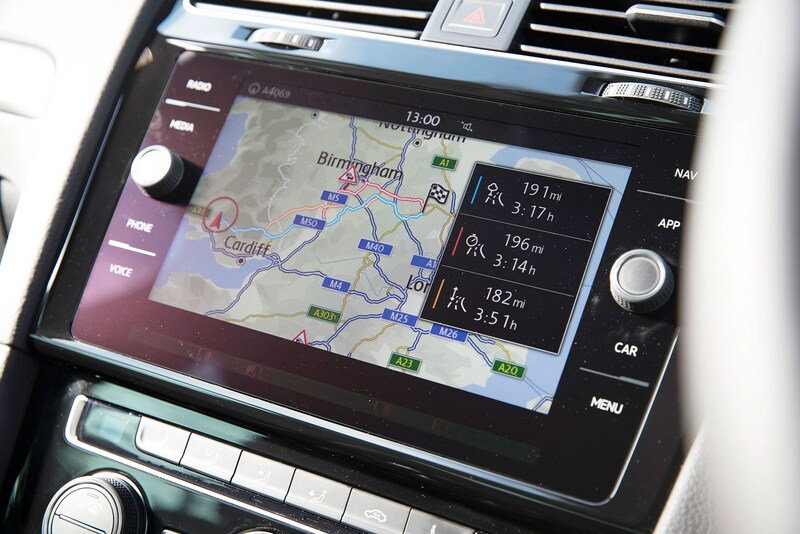 As standard, the GTI gets the Discover Navigation system and an 8.0-inch touchscreen – Discover Pro, with its 9.2-inch screen, wasn’t fitted to our test car. The screen is beautiful and the system rapier-sharp, but the usual caveats apply – without the tactile feedback of a button, blind-reach inputs are all but impossible to make and it’s infuriatingly easy to hit the wrong thing by accident.